It’s Friday and that means strategizing and planning the weekend wardrobe. Our Milton envelope clutches perfectly coordinate with dressing up or dressing comfortably in laid back jeans and your favorite button down. The distinctly classic envelope shape is large enough without being oversized and difficult to carry. (The interior back pocket holds an iPad and iPad Mini. There are even leather credit card slots and a smartphone pocket.) The black lambskin flap is a lightly pebbled texture and provides a beautiful contrast to the rest of the body. 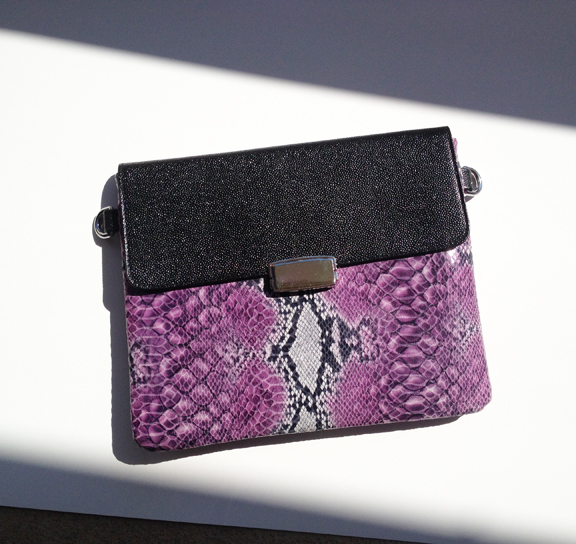 The main body of the clutch is an incredibly soft lambskin in a snake print. It’s the perfect combination of design and luxury craftsmanship. Each of our designer handbags is individually handcrafted.